Watch the videos from each panel, read the transcript, view the photo gallery and the photo slick, and read the WebMD live recap. Where is science taking us and how do we leverage the opportunities before us to advance medical progress? Leaders representing various sectors of the research community expressed their views on legislative and regulatory issues, and our nation's research infrastructure at Research!America’s 2015 National Health Forum Thursday, September 10 at the Newseum in Washington, DC. 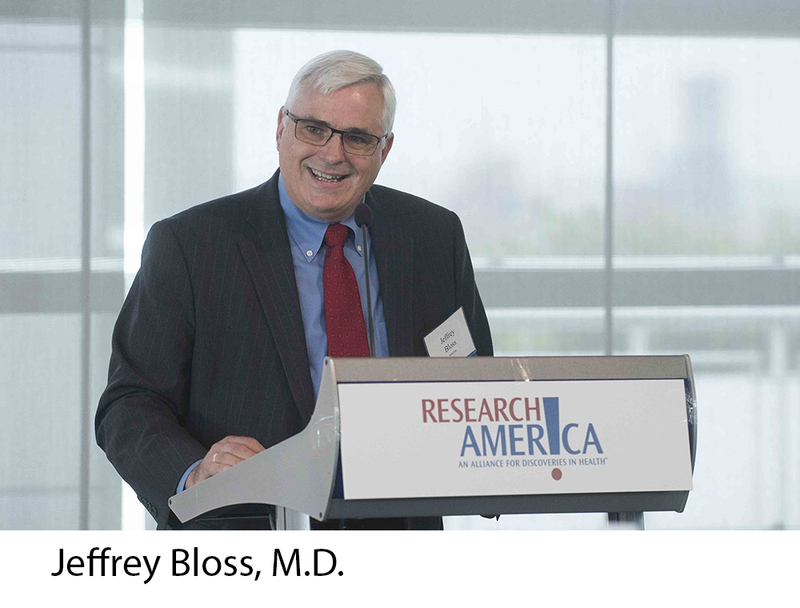 Jeffrey Bloss, M.D., senior vice president of scientific and medical affairs, Astellas Pharmaceuticals U.S., lead sponsor of the event, discussed the importance of collecting, analyzing and disseminating real-world evidence, and engaging in value-based decision making. “Patient care will benefit from modernized regulatory framework that encourages the development and dissemination of accurate, data-driven information that includes real world data to improve patient care,” Bloss said. “And we rely on impassioned advocacy to achieve these changes." and discussed the relationship between patient advocates, industry, policymakers, and other stakeholders in assuring the development of new treatments and technologies. Panelists discussed the importance of public-private partnerships, challenges with privacy in the age of data sharing and the need for more collaboration among researchers. “Broad partnerships across the board are lacking, and… if we really want to embrace personalized medicine we really have to break down those silos,” emphasized Anil Jina, senior vice president and head of global medical affairs at Shire. Other panelists included; Sudip S. Parikh, Ph.D., vice president and general manager of health & analytics, Battelle; and Vincent A. Forlenza, chairman, chief executive officer and president, BD. Anne Schuchat, M.D., principal deputy director, Centers for Disease Control and Prevention, noted that public opinion is shifting on vaccines with recent measles outbreaks. And Lucinda L. Maine, Ph.D., RPH, executive vice president and CEO, American Association of Colleges of Pharmacy, said pharmacists could play a critical role in administering vaccines in communities across the country. Other panelists included Barbara Newhouse, president and CEO, The ALS Association; Reed V. Tuckson, M.D., FACP, managing director, Tuckson Health Connections, LLC. “We shouldn’t overlook some of the really important things, such as...more focus on groups that are not currently well represented in clinical trials, including minorities, women and children, and decreasing the regulatory burdens for scientists and the FDA,” said Larry J. Shapiro, executive vice chancellor for medical affairs, Washington University in St. Louis. Other panelists included William Hait, M.D., Ph.D., global head of research & development, Janssen Research and Development; Amy Comstock Rick, J.D., president and chief executive officer, Food and Drug Law Institute; and Marc Boutin, J.D., chief executive officer, National Health Council. View the 2014 National Health Research Forum photo gallery and the photo slick, read the transcript and watch videos from each panel.